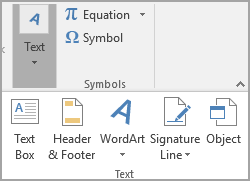 In Microsoft Office, you use either WordArt or a text box to add text on top of a photo. You can move the WordArt or text box over your photo and then, depending on which Microsoft Office program you're using, rotate the text to best fit your photo. The best method to use depends on what you're trying to achieve and which Microsoft Office program you are using. Do you want the text to have a very stylized look? Are you trying to achieve an affect similar to what you might see on a postcard? Is the text short in length? If so, then WordArt might be your best option. The other option to add text on top of a photo is to draw a text box, type the text you want in the text box, and then make the background and outline of the text box transparent. You can format the text in the text box, just as you format text anywhere in Office. This option is especially useful when you want to add more than just a word or two to your photo. Select the Office program that you are using from the drop-down list. In your spreadsheet, make sure that you've inserted a photo. On the Insert tab, in the Text group, click WordArt, click the style of text you want, and then type your text. Click the outside edge of the WordArt to select it, drag the text over your photo and then, if you want, rotate the text to the angle that works best for your photo. Click the outside edge of the photo, press and hold CTRL, and then click the edge of the WordArt so that both items are selected. Under Drawing Tools, on the Format tab, in the Arrange group, click the arrow next to Group, and then click Group. On the Insert tab, in the Text group, click Text Box, click anywhere near the picture, and then type your text. To change the font or style of the text, highlight the text, right-click it, and then select the text formatting you want on the shortcut menu. Click the outside edge of the text box, drag the text over your photo and then, if you want, rotate the text to the angle that works best for your photo. Click Shape Fill, and then click No Fill. Click Shape Outline, and then click No Outline. Click the outside edge of the photo, press CTRL, and then click the edge of the text box so that both items are selected. In your presentation, make sure that you've inserted a photo. Click the outside edge of the WordArt to select it, drag the text over your photo and then, if you want to, rotate the text to the angle that works best for your photo. On the Insert tab, in the Text group, click Text Box, drag to draw a text box anywhere near the picture, and then type your text. In your document, click to select an insertion point. On the Insert tab, in the Illustrations group, click Shapes, and then click New Drawing Canvas. Click the drawing canvas, and then, on the Insert tab, in the Illustrations group, click Pictures. Browse to and double-click the photo that you want to use. Under Picture Tools, on the Format tab, in the Arrange group, click the arrow next to Group, and then click Group. Browse to and double-click the photo that you want to use, and then click outside the drawing canvas. On the Insert tab, in the Text group, click Text Box, and then at the bottom of the menu, click Draw Text Box. Type the text that you want to appear in the text box, and then drag the text box to the location that you want. To change the font or style of the text, highlight the text and then select the text formatting you want on the shortcut menu. Click the outside edge of the text box, and then drag the text box to position it over your photo. Click the drawing canvas, and then, on the Insert tab, in the Illustrations group, click Picture.